Forum Index > Historical Arms Talk > Show us your Arming Clothes! How many layers (of heavy weight) do you guys use? I'd imagine 12 to 16 if one only wears primarily maille, but perhaps far fewer under primarily plate. I must get onto making one (or getting one made) as standing 174cm tall and weighing in a 65kgs, it's hard to find one small enough... Than again that has been mostly off the shelf stuff thus far. And where can one get said martirials... In Aus preferably. my arming jacket is 4 layers of linen and padded only in the body area. if its multi layered like 16 layers, it would be more of a jack in itself than an arming jacket no? ... my arming jacket is 4 layers of linen and padded only in the body area. if its multi layered like 16 layers, it would be more of a jack in itself than an arming jacket no? But I'd imagine it's thicker than the stuff shirts are made of it not? I figure it'd be about that thick or thicker but I agree with Chuck that 16 layers of linen is likely too think for under armour, especially on the arms. You'd have a hard time with full plate and/or mail over it on the arms. Personally my under armour has always (and likely will always) have some padding but none since the first one have had equal padding over all, especially regarding the arms. I think that there is nothing wrong doing a multi-layered, padded or mixed layered/padded arming clothing, though I know of no evidence for multilayered linen or othr material textile armours until the 2nd half of the 14th. 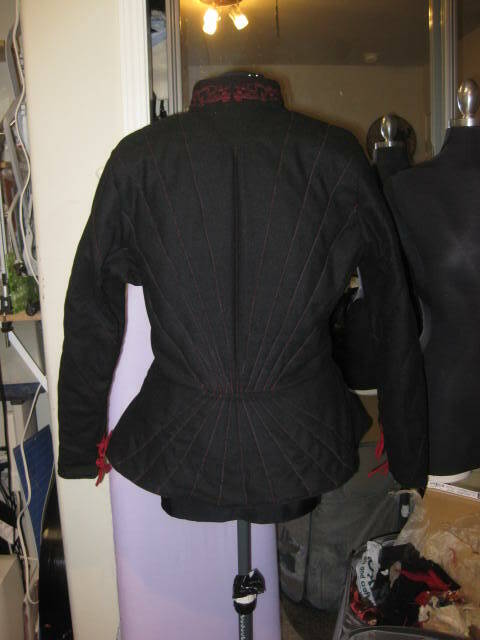 This is my gambeson/aketon that I made. Specifically - gambeson under the maille and gambeson from morgan bible recreation but used cord instead of buttons as they were beyond me at the time. Inner shell is linen, then cotton batting, then the linen outer shell, it is quilted in vertical lines as can be seen. 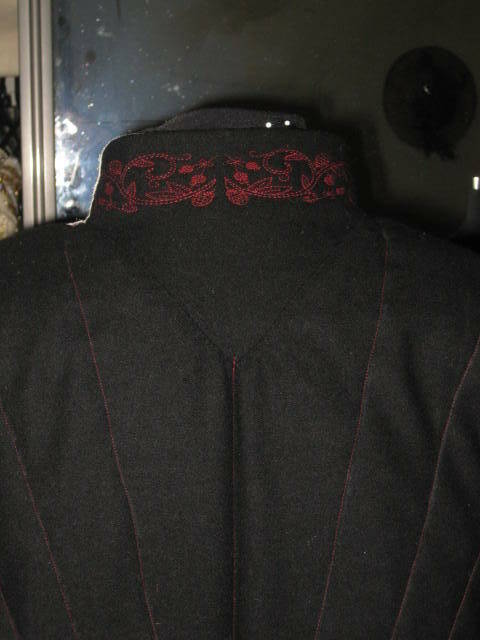 It has been machine sewn as I wasn't going for complete accuracy in the stitching methods and time was of the essence. In reality I should have made it a little longer, the split in the neck hole shorter and the central split a little higher, but there is always next time when this one wears out. I can say that this keeps you nice and warm in the cool breezes but also breathes when you are in the sun. Finally got myself a new arming coat. 1490's to 1510 is my window. Decided to go with a fusion of German and Italian. Not all the points are in yet and since these photos have been taken, the front ties have been changed so it closes completely. The armpit design will change a little too. When I wear it the "flair" at the hips closes in a little more than shown. It's made to my exact measurements and fits wonderfully. The shell is made of 100% black wool cashmere, the lining is red linen. There is little to no additional padding. There is a small amount in the shoulder areas and front of the chest, a single layer of bamboo batting (identical to cotton in handling, but naturally antibacterial and cooling). Once my tweaking is done, I'll start building the armour off of it again since I'm replacing my old one with this one. I really need to get some shots of me wearing the thing, but for now, this is all I have...can't really see how it works with the armour though. Hm. 12 layers still seems okay under primarily maille, then again I guess I won't know until I try. Who knows, I might get to 4 layers and find it plenty. And Michael, is that your real beard? whoa, metal. First off, I apologize for the thread necromancy, but as this thread deals directly with a few products I'm wondering about, hopefully one of you guys will be able to fill me in. I've been mulling over picking up one of Revival clothing's linen 14th century gambesons (and pourpoint) for a knight banneret kit circa 1400, the very one Ian's wearing in the opening post. I'm wondering just how thick the gambeson is and if using one is a viable option despite the fact that I'm forgoing a full maille shirt in exchange for only a maille skirt. I currently own Revival's agincourt arming cotte, and although it's nice, I've had some minor issues in the fit department and feel just a bit more padding may prove useful. If anyone could tell me just how thick the Revival gambeson is, perhaps in comparison to the agincourt cotte, I would be eternally grateful. Here's to hoping it's just a bit thicker and not anything too extreme. Thanks in advance! As one of the fit models for both products, maybe I can help. 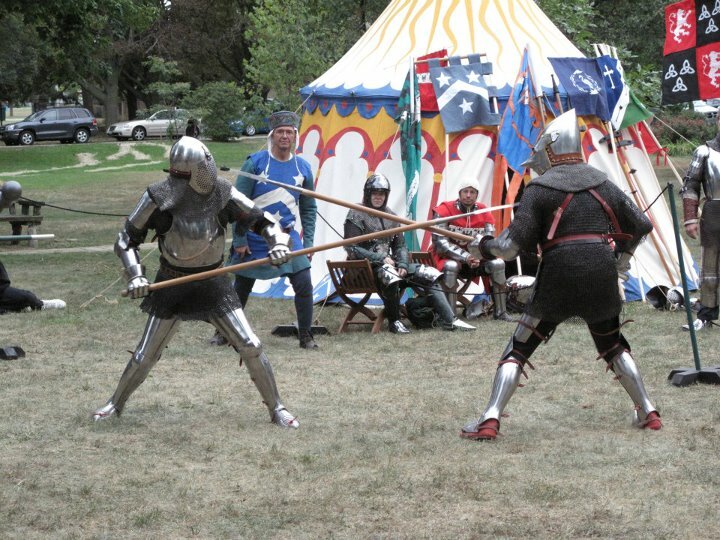 Now, if you are wearing a short sleeved haubergeon, it shouldn't affect the fit of a breastplate or cuirass, but depending on how well the armpit is cut on the mail, it might bunch with the gambeson or impede your shoulder defenses. My arm harness is a close fit, made by Jeff Wasson and it will fit around the gambeson. However, when neither Christian nor I wear it in conjunction with our mail, but use an arming cotte instead, as you can see below. (I'm the one with the houndskul). I hate to answer "depends", but there you have it. I really does depend on your harness. Did you as the Revival folks about modifying your arming cotte? Might be cheaper than buying another garment. Otherwise, if the gambeson won't work, you might want to go with a commissioned garment. Many thanks for the extensive insight. I was not aware RC would modify clothing. The agincourt arming cotte I own is a bit short in the sleeve and seems to bind somewhat oddly when my arms are extended. 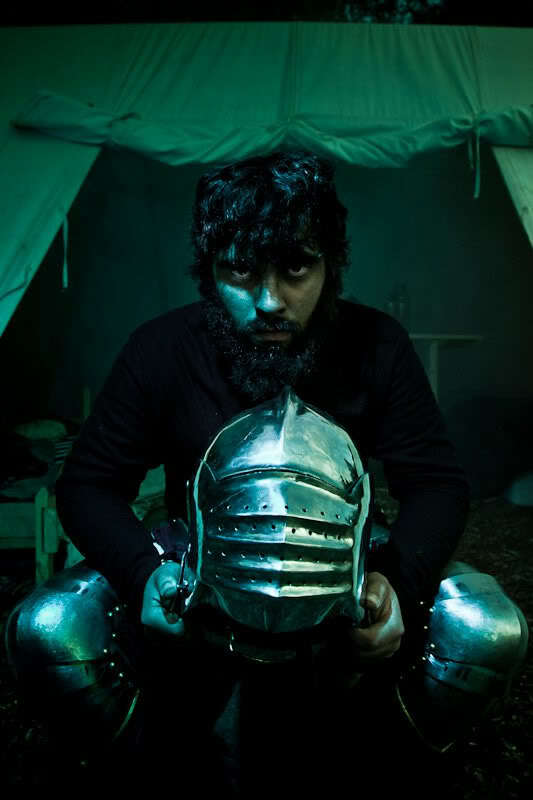 I suppose considering the time period I've chosen, the turn of the 15th century, either arming garment would be reasonable, though the gambeson may be more appropriate. I'm glad to hear that the linen version isn't overwhelmingly thick. My arm harness is eligible for replacement, though the current one has just a bit of extra room. Like I said, I don't intend on wearing a full haubergeon beneath my cuirass and plan on sticking with a maille skirt. I guess in the end I'm probably going to have to take a stab at it and see what happens. If it wouldn't be a bother, what folks do you recommend as far a commissions go? Yours and Christians kits are downright gorgeous. Love all the pageantry present! Ahh yes. I've heard great things of her work before. 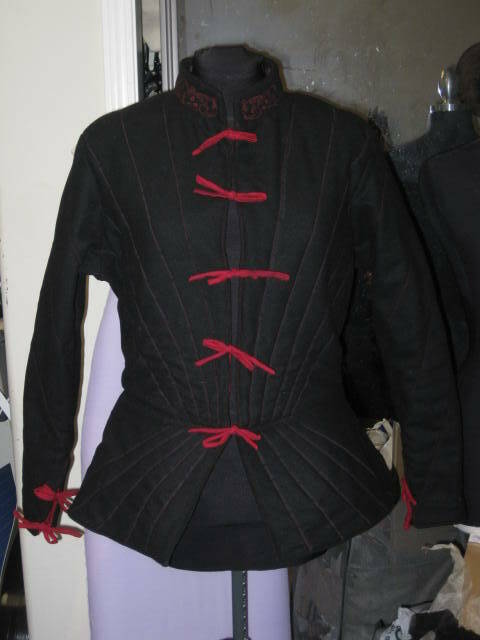 I was actually intending on contacting her within the next few months to possibly produce a surcoat for me. The piece she made for you looks like a great arming garment. Very impressive. I've got some considering to do! My arming garment made by myself is heavily inspired by pourpoint of Charles de Blois with well known feature of grand assiette sleeves. It's closed by set of six laces with brass aiglets. Natural shaping of the pourpoint and close fitting to my waists works as arming girdle/lendenier for leg suspension where from the inside there are small leather squares to tak some pressure from the fabric. I posses lendenier as well. Don't mind my slightly padded hosen. 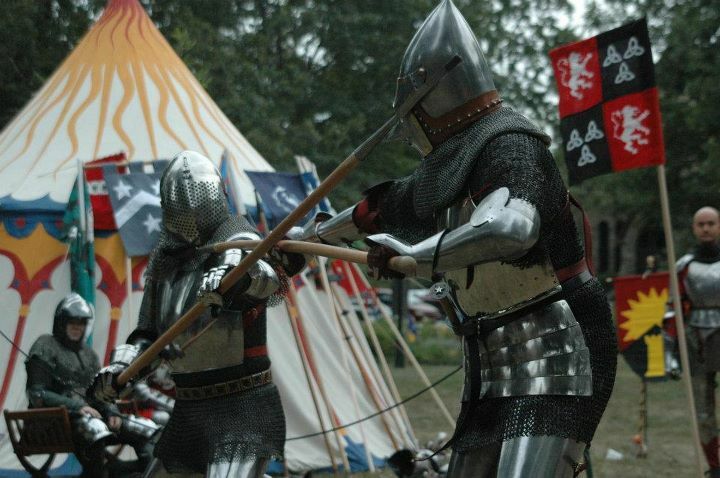 Please note that I'm no reenactor or living history practitioner and I come from medieval combat sport background which I finally decided to leave and try to move on in more historical way so there are some limitations in terms of historical accuracy and the way I made it.